What is a PSTH and what is it good for? A PSTH shows the distribution in timing of events, relative to a specified trigger event. For example, suppose you are monitoring a pulse train that has a nominal frequency of 100 Hz, meaning the onset of each pulse should be 10 msec from the prior one. 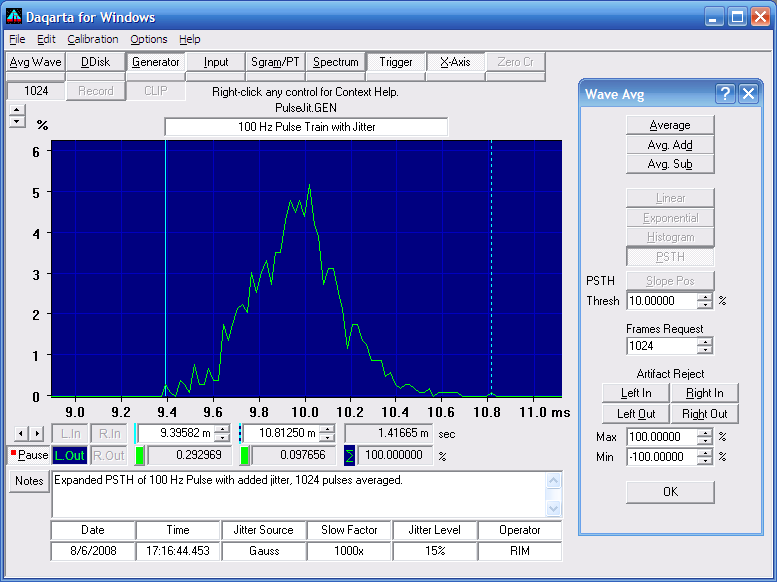 If you set the Trigger to start a waveform display when it detects a pulse, you expect to see the next pulse starting exactly at the 10 msec point. The real-time display should thus look stationary. Here you can see the actual distribution in the timing. The cursor readouts can be moved to show the percent of events at any given time, while the Sigma readout shows the total percent of events between the cursors. Here, 100% of the pulses are between 9.4 and 10.8 msec. The "Stimulus" part of the PSTH name refers to the main Trigger event that is the timing reference. In the above example, that was just one of the pulses in the train, since we were interested in the relative pulse-to-pulse jitter. But in general it could be an arbitrary event, typically on a different input channel, or it could be an internally generated stimulus whose output is used to induce a response in a system under test. 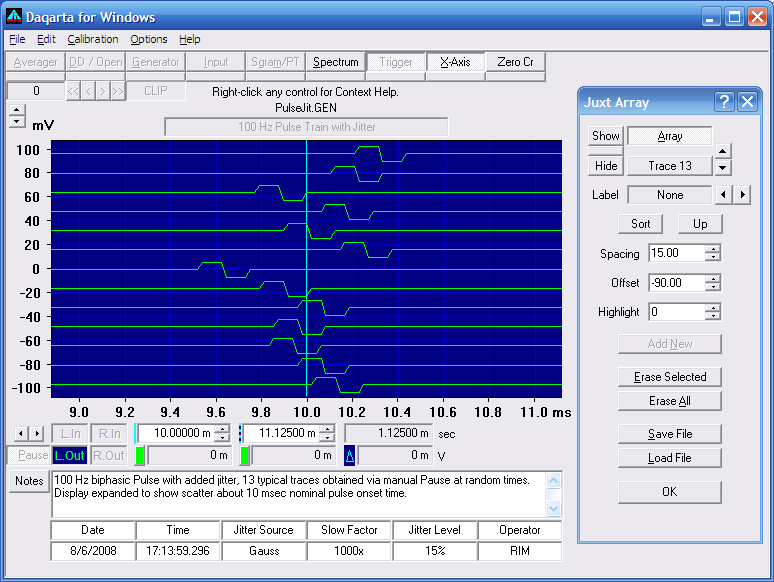 The Waveform Averager dialog at the right in the above image shows the Slope and Threshold used for the PSTH events. Here they are set the same as the main Trigger (not shown), but in general they can be different. You would set these for the events on the channel of interest, and ignore (or toggle the display off for) the irrelevant display on the Trigger channel. The PSTH is typically used in biological studies of neuron firing changes in response to a repeated stimulus such as a light flash or tone burst. The "Post-" part of the name refers to the display of times after the Trigger event, but you can easily make that "Peri-Stimulus" by setting a negative Trigger Delay. Then you'll see events that happened just before the trigger as well. In this case the trigger is usually not a "stimulus", but is itself a response... and you want to see what caused it. This technique is often called " Reverse Correlation", and it's useful for everything from neurons to nuclear reactor anomalies. The basic idea is that you trigger on the target event, while running the PSTH on some candidate causal event. If, after some statistically significant number of target events, the candidate PSTH shows a healthy peak before the 0 trigger time, then it is correlated with and is a precursor to the target event... strengthening the case for it being causal.